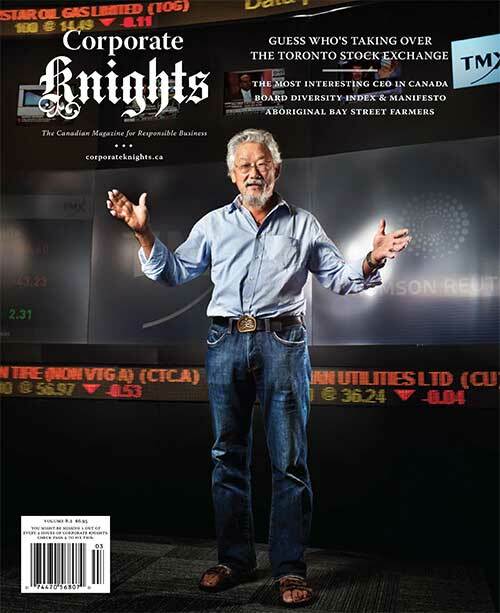 CK editors Toby Heaps and Melissa Shin caught up with legend of green David Suzuki at the Toronto Stock Exchange. The Exchange is the central organ that breathes life into the economy, and one Suzuki has often exhorted for its blinkered assault on the environment. But the “Suz’s” rendez-vous on Bay Street makes perfect sense. After all, the TSX is now home to more cleantech companies than any other exchange in the world. Many of these companies, like geothermal player Magma Energy, have the know-how to dramatically transform our society to live in greater harmony with the planet. The question is, will they do it from a Canadian base? The answer, Suzuki suggests, depends in large part on whether Canadians can believe in ourselves and think big—for a change. Can Canada be a global leader in cleantech? I hate the fact that our governments have done nothing in this area and yet they say we are world leaders. We are not world leaders! Canada could have been up at the head of the pack but we failed over and over again. In 1978, the Science Council of Canada, headed by Ursula Franklin, said that if Canada made the investments now, we could become the leaders in wind power, solar, and geothermal. And what did we do? Nothing. Germany and Denmark, they all did the right things and now that is where the jobs are. Germany has created 400,000 jobs in the renewable energy sector. Denmark gets 20 per cent of its energy from windmills. Canada did nothing. In Canada, we have never really had the confidence in what we are doing to say let’s put our money here and become global leaders. We blow it again and again because we don’t believe in ourselves. We have to fund a lot of the technologies that already exist. We have to get on with reducing emissions, which means we have to subsidize wind, solar, geothermal – all the renewables. We need to put a price on carbon. We use technology as a solution before the technology has even been proven. For instance, our government is putting a huge emphasis on carbon capture and sequestration. It is a totally unproven technology and to invest in it exclusively is crazy. Thirty years ago, the most promising renewable energy option was fusion. We poured billions of dollars into fusion energy and it is still not viable. Now they are saying, “We’ll develop the tarsands because we have carbon capture and sequestration.” It is a crazy way of planning. As soon as the Kyoto Protocol came out, the Alberta oil industry said, “Why should we do this when countries like China and India aren’t?” As the instigators and major contributors to the problem, it is up to us to show leadership. If we continue to say we have to have more growth, why on earth should the Chinese pay any attention to us? Why should they do what we refuse to do ourselves? It is up to the industrialized countries to show leadership and we haven’t done that. I bought the first Prius sold in Canada and I love it. I think the technology is fantastic. Laptops absolutely revolutionized my life but they are part of the problem now. These products turn over at such a rate and end up in garbage dumps in phenomenal quantities. Virtually everything we buy now is built for fashion, not durability. It costs you more to fix them than it does to buy a new one. I think obsolescence is deliberately built into these things and it is a huge part of the problem. I have grandchildren so at the end of the day I have nothing but hope. I interviewed Jim Lovelock who invented the idea of Gaia and he has basically given up. He says 90 per cent of humanity will be dead by the end of the century. But I refuse to accept that prognosis, because you need hope. We have no idea how forgiving nature can be. The situation is desperate and we need to act now. Right now, the biggest impediment to action is the government we have in Ottawa. What they are doing now in the face of all the evidence is absolutely criminal. It is an inter- generational crime. And I hope Canadians voice their concern.